In 1989, Nestor Sepulveda, John Wikswo and I published “Current Injection into a Two-Dimensional Anisotropic Bidomain” (Biophysical Journal, 55:987–999). Of my papers, this is one of my favorites. When I teach my graduate Bioelectric Phenomena class here at Oakland University, we study the Sepulveda et al. (1989) article. The primary goal of the class is to introduce students to bioelectricity, but a secondary goal is to analyze how to write scientific papers. When we get to our paper, I let students learn the scientific content from the publication itself. Instead, I use class time to analyze scientific writing. 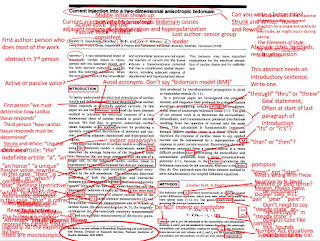 The paper lends itself to this task: It is written well enough to serve as an example of technical writing, but it is written poorly enough to illustrate how writing can be improved. Critically tearing apart the writing of someone else’s paper in front of students would be rude, but because this writing is partly mine I don’t feel guilty. 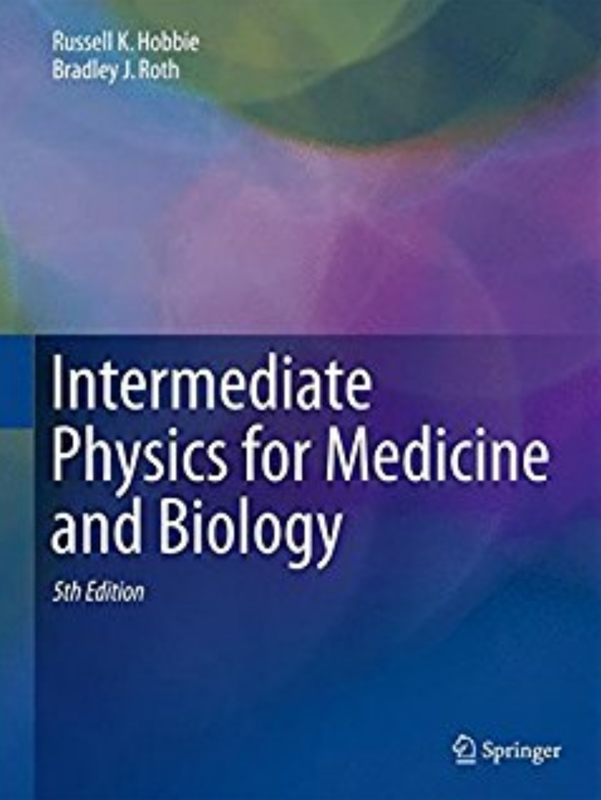 Many readers of Intermediate Physics for Medicine and Biology will eventually write papers of their own, so in this post I share my analysis of scientific writing just as I present it in class. Students read “Current Injection into a Two-Dimensional Anisotropic Bidomain” in advance, and then during class we go through the writing page by page, and often line by line, using a powerpoint presentation that I have placed on the IPMB website. I use the “animation” feature of powerpoint so edits, revisions, and corrections can be considered one at a time. To see for yourself, download the powerpoint and click “slide show.” Then, start using the right arrow to analyze the paper. A screen shot of the first page of the powerpoint. It looks a mess, but the animation feature lets you consider all these suggestions one by one. You can download it and use it to teach your students. One reason I use Sepulveda et al. (1989) as my example is that it has the classic format of a scientific paper: Introduction, Methods, Results, and Discussion. It also contains an Abstract, References, and other sections of a scientific publication. Often I highlight a sentence or two of text and ask students to revise and improve it. If you are leading a class using this powerpoint, stop and let the students struggle with the revision. Then compare their revised text to mine. The class should be interactive. I have talked before in this blog about the importance of writing. In the powerpoint, I mention two publications that have helped me become a better writer. First is Strunk and White’s book Elements of Style. The powerpoint illustrates much of their advice—such as their famous admonition to “omit needless words”—with concrete examples. You can read Elements of Style online here. Second is N. David Mermin’s essay “What’s Wrong with These Equations” published in Physics Today (download it here). Mermin explains how to integrate math with prose, and introduces the “Good Samaritan Rule” (remind your reader what an equation is about when you refer to it, rather than just saying “Eq. 4”) and other concepts. Some of the points raised in my powerpoint are trivial, such as the difference between “there,” “their,” and “they’re.” Others are more substantial, such as sentence construction and clarity. I find it takes most of a 90 minute class to finish the whole thing. On the sixth page of the powerpoint I have a note reminding me to “Tell Story.” The story is one I wrote about in the original version of my paper “Art Winfree and the Bidomain Model of Cardiac Tissue.” “Nestor Sepulveda, a research assistant professor from Columbia who was working in John [Wikswo]'s lab, had written a finite element computer program that we modified to do bidomain calculations. One of the first simulations he performed was of the transmembrane potential induced in a two-dimensional sheet of cardiac tissue having 'unequal anisotropy ratios' (different degrees of anisotropy in the intracellular and extracellular spaces). Much to our surprise, Nestor found that when he stimulated the tissue through a small cathodal electrode, depolarization (a positive transmembrane potential) appeared under the electrode, but hyperpolarization (a negative transmembrane potential) appeared near the electrode along the fiber direction (Fig. 2). The depolarization was stronger in the direction perpendicular to the fibers, giving those voltage contour lines a shape that John named the ‘dogbone.’ Only Nestor understood the details of his finite element code, and I was a bit worried that his program might contain a bug that caused this weird result. So I quietly returned to my office and developed an entirely different numerical scheme, using Fourier transforms, to do the same calculation. Of course, I got the same result Nestor did (there was no bug). Although I didn’t realize it then, I would spend the next 15 years exploring the implications of Nestor’s result.” During class, I often take off on tangents telling old “war stories” like this. I can’t help myself. John Wikswo, my coauthor and PhD dissertation advisor, is still active, and he and I continue to collaborate. I learned much about scientific writing from him, but our writing styles are different and he might not agree with all the suggestions in the powerpoint. Tragically, Nestor Sepulveda has passed away; a great loss for bioelectricity research. I miss him. 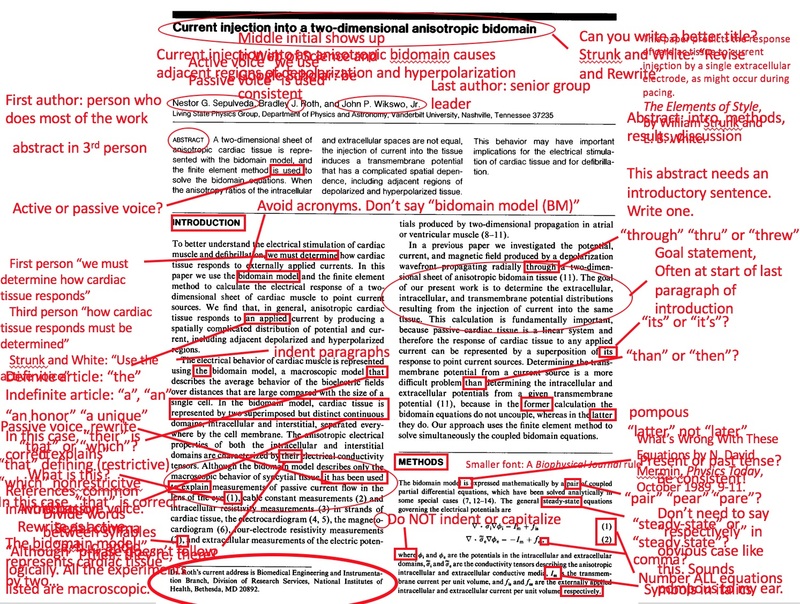 If you are teaching and want to discuss how to write a scientific paper, feel free to use this powerpoint. I encourage you to download it and modify it to suit your needs. Students could even use it for self study, although they would not see some essential hand waving. Although the powerpoint suggests many changes to the Sepulveda et al. (1989) paper, I nevertheless consider that article to be a success. According to Google Scholar, it has been cited 379 times. I believe it had an impact on the field of pacing and defibrillation of the heart. Overall, I am proud of the writing. Let me close by emphasizing that writing is an art. Your style might not be the same as mine. Take my suggestions in the powerpoint as just that: suggestions. Yet, whether or not you agree with my suggestions, I believe your students will benefit by going through the process of revising a scientific paper. It’s the next best thing to assigning them to write their own paper. Enjoy!